The sun was setting as we approached the elegant hotel, our getaway for our anniversary weekend. Although we had lived in the Northwest for over 18 years, we had yet to visit this renowned site. The time had come to treat ourselves to a little European hospitality, right in the heart Oregon. The Columbia Gorge Hotel sits high on a bluff, overlooking the Columbia River below and the Gorge extending east and west. 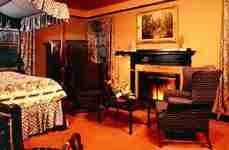 It would be a purely romantic setting for our weekend of relaxation and exploration. Sumptuous treats tantalized our taste buds the entire stay. Breakfast, included in the room rate, was a four course celebration. Fruits, juice, oatmeal, pancakes, eggs, bacon and muffins, drizzled with a fresh honey waterfall, has been trademarked as the "World Famous Farm Breakfast." Dining in the Columbia River Court, we were treated to a delicate salmon filet with champagne sauce and a dessert of a mousse and ice cream-filled chocolate swan. This was not a weekend to be counting calories! 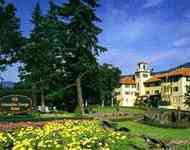 We were intrigued by this stately hotel with its expansive gardens, creek and waterfall. Oregon lumber magnate, Simon Benson, built the Hood River hotel in 1921 with a dream to create a masterpiece for travelers who explored the Columbia Gorge Scenic Highway. This route meanders past cascading waterfalls, parks, and hiking trails and offers expansive views of the Gorge and its lush beauty. Benson brought in Italian stone masons to add embellishments to his hotel that he called the "Waldorf of the West." It has become one of the jewels of the Gorges landscape. With just a few days to explore, we were determined to sample as many activities that we could. Here are some of the highlights and what you can expect to experience on your visit. Hood River is the windsurfing capital of the world and a sport-lover's paradise. Whatever the season, there are leisure activities to whet your palette. Into hiking? There are miles of intermediate to advanced trails, one of which takes you to the top of Multnomah Falls. At 620-feet, it is the second highest in the country and the largest of the 11 falls which plunge to the Gorge floor. A Visitor Center and restaurant are housed in the historic lodge at its base. Rainbows of colorful sails dance in the waters of the Columbia in spring, summer and fall. The winds that are channeled through the Gorge provide the energy for the hundreds of windsurfers that flock to this ideal environment. In early June the Columbia Gorges oldest slalom windsurfing competition, the High Wind Classic, attracts some of the worlds best windsurfers. Mt. 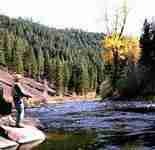 Hood, with its Cascade lakes and fine fishing opportunities, will draw out the angler in you. If that is too tame, you can ski year round on its magnificent slopes, carving perfect 8s in winter powder or sampling summer skiing and snowboarding on Timberlines Palmer Snowfield. Mountain bikers and rock climbers will also find challenging terrain. During the 1830s and 1840s, the Gorge was the most feared portion for pioneer families who made the trek from the Midwest to the farmlands of the Willamette Valley of Oregon. Immigrants dismantled their wagons and loaded all their possessions on rafts, then floated the Upper Cascades. By the late 1840s most immigrants bypassed the river passage through the Gorge and took a difficult route over Mount Hood via the Barlow Trail. Many historic markers, including the Pioneer Womens Grave and the old Toll Gate, can be viewed when you explore portions of the Oregon Trail. Across the river from Hood River lies White Salmon, Washington. About 35 miles east along State Route 14 is a unique museum that is a "must see." Featuring a permanent collection of August Rodin sculpture and drawings, it also boasts an extensive Native American collection, Russian icons and Theatre de la Mode. Maryhill Museum has a variety of special exhibitions and performances, a cafe and picnic grounds. 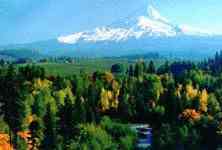 The Hood River Valley provides the perfect climate for growing fruit in its rich volcanic soil. Cherries, apples and world-famous pears are a testament to the region. Local wineries have tasting rooms to let you sample their wares. Dont miss the unique beers at Hood Rivers local micro breweries and pubs. With so much to see and do, our two-day visit just got us started in exploring this impressive region. Well have to return to sample more of the Gorges treasures. 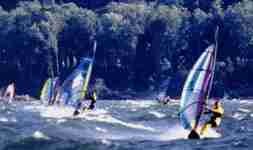 Maybe this is the summer to learn to windsurf the Columbia! Click her for details in planning your own trip to the Columbia River Gorge.